All dogs lose their appetite once in a while. As long as your dog acts normal otherwise, loss of appetite for one or two days isn’t a cause for concern. But any sudden loss of appetite that lasts longer than two days requires veterinary attention—sooner if your puppy acts sick. Young puppies have smaller fat and fluid reserves and can’t go without food longer than about 12 hours before needing medical help. Toy breed puppies are particularly prone to potentially deadly drops in blood sugar (hypoglycemia) if they skip a meal. Why Do Puppies Refuse to Eat? Anorexia, or loss of appetite, may be abrupt, with your pup suddenly refusing to eat, or gradual, so that it's eating less over the long term. A number of factors can contribute to your puppy's anorexia. 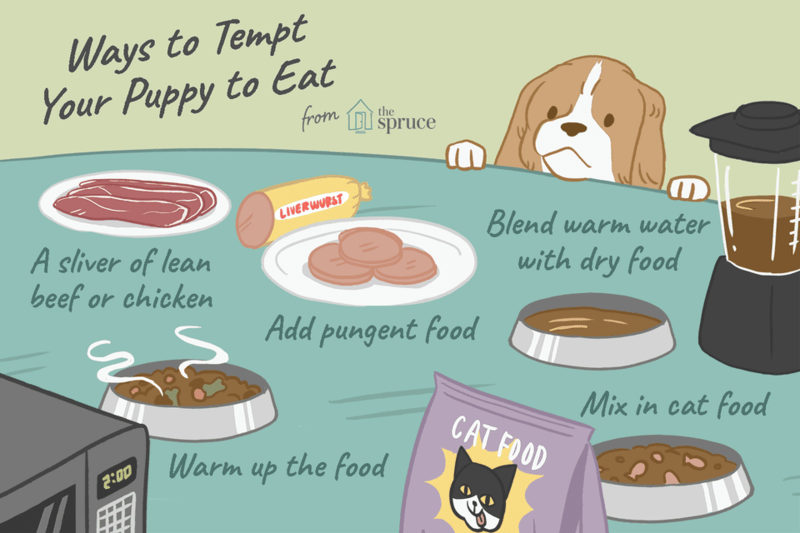 Some finicky pups develop preferences for certain foods and refuse to eat anything else. When you give in and feed your puppy its desired food, you've taught it how to get its way. If your vet has confirmed that your puppy is otherwise healthy, practicing “tough puppy love” may convince it to eat your choice of food during scheduled feedings. Stress can suppress your pet's desire to eat; being left at the kennel or losing a beloved family member that results in separation anxiety can suppress the dog's appetite as well. Just the stress of an unfamiliar family member visiting could prompt anorexia. High outdoor temperatures can also kill a pet's appetite. Anorexia is the most common sign of illness in dogs and often occurs in conjunction with a fever. Nearly any illness can cause a puppy to refuse to eat, from cancer to serious infection to kidney failure. If your dog's anorexia lasts for more than two days, be sure to have your veterinarian rule out any illnesses before trying any techniques to coax your puppy to eat. 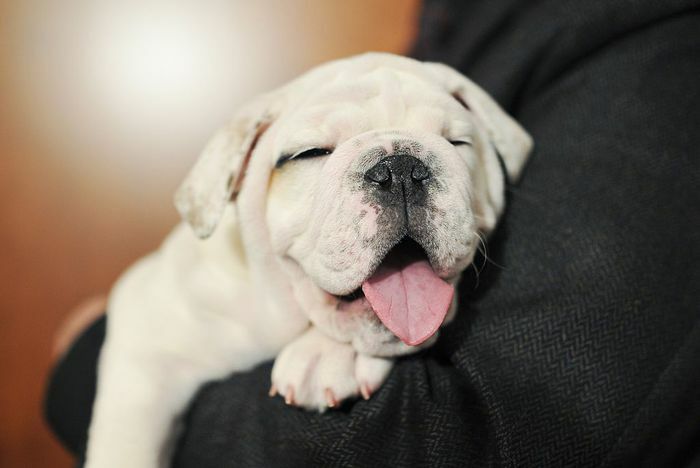 You’ll need a diagnosis from your veterinarian to figure out why your puppy has stopped eating. If your vet rules out illness, it’s often perfectly OK to tempt your puppy with ​healthy people food and employ other techniques to encourage it to eat. Offer wholesome tidbits like a sliver of lean beef or chicken. This will also help you decide if your puppy is just being finicky or really has a problem that needs veterinary attention. Stimulate your puppy's appetite with pungent-smelling foods that may make eating more attractive. Liverwurst and peanut butter are common favorites. Give your puppy meat-based baby food, which is palatable to most puppies and easier to eat with a sore mount. Add warm water or no-salt chicken broth to dry foods to make a slurry in the blender. Warm up your puppy's food by zapping it in the microwave for 10 seconds or so, which can unlock the food's aroma and pique your pup’s appetite. Spike your puppy's regular food with yogurt or cottage cheese for another good way to tempt your dog to eat or offer a small amount of a stinky canned product with high meat or fat content. Mix some dry cat food with your pup’s food if you have a cat. The aroma and higher protein content of cat food are very appealing to most dogs. Try hand-feeding your reluctant pup. Offer your reluctant eater a small amount of food, and when it's had its fill or refuses to eat, take the food away and try again an hour later. Leaving food out for a reluctant eater for long periods may overwhelm the appetite centers in the brain, which may kill any appetite your puppy has left. Utilize a little behavior modification if your veterinarian has ruled out a health issue and your puppy is turning its nose up at even the tastiest foods. Cut back on treats (as with kids, treats tend to spoil a puppy's appetite for meals) and stick to your dog's regular feeding schedule. Buy a new food dish or move the old one to a new location, which might make it a little more interesting; you might even try using a food dispenser that your pup can partially control. Take your dog for a walk or engage in another type of exercise with it before mealtimes if its appetite still isn't what you'd like it to be. Talk to your veterinarian if your puppy's case is severe. She may recommend drugs to help stimulate its appetite. At other times, force-feeding your pup a paste-like diet via syringe may be recommended. In rare cases, the vet may resort to placing a feeding tube directly into your puppy's stomach to force-feed it. Seek veterinary attention immediately if your puppy shows signs of low blood sugar or hypoglycemia, such as a drunken-type gait, weakness, and occasional seizures. In the meantime, if it loses consciousness, you might try boosting its low blood sugar by applying something sweet to its gums, such as a very small amount of pasteurized honey. Never use raw honey, which may contain botulism spores, and refrain from giving honey of any sort to canines with diabetes or obesity issues.